Make sure the door latches securely without slamming it. 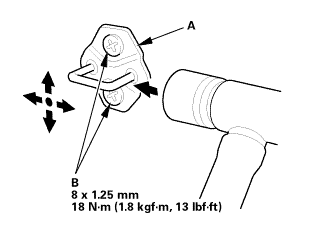 If necessary, adjust the striker (A): The striker screws are fixed, but the striker can be adjusted slightly up or down, and in or out. Wrap the striker with a shop towel, then adjust the striker by tapping it with a plastic hammer. Do not tap the striker too hard. Hold the outer handle out, and push the door against the body to be sure the striker allows a flush fit. If the door latches properly, tighten the screws to the specified torque, and recheck.